The next day was yet another blissful, clear and sunny day: unbroken blue skies and a clear, wintry light. After breakfast, we were keen to go for a walk in the surrounding countryside, and asked David, our host at Los Arcos, who had run hiking holidays, for suggestions for a two-hour trip from the village. In an instant, a map was produced and a circular route was recommended taking us out of the village, up into the hills to the neighbouring village of Nechite, then across the southern slopes of the mountain in the direction of Yegen before dropping back down into Válor. Yet again, this was another stunning walk. The temperature was perfect, the sun brilliant, and we faced south for the entire route. The climb up towards Nechite was fairly steep, but we should be getting used to this by now. Seemingly, in this part of Spain, you can’t take a step outside without tackling a 20% incline. I must be getting fit, surely! Actually, there is no doubting that I can tackle hills with a lot more stamina that when we first arrived, and once warmed up I can face most terrain with the agility of a mountain goat……Andrew has always been fit, but then he is a year or two younger then me! This walk is known as Los Almendros, and understandably so, as it weaves through terraces of almond trees. The views are breathtaking. Nechite is a sleepy hamlet; we dipped down off our route to try and get a coffee, but similar to our own village, there was no cafe. There was, however, a small bar but without any signs of life. Unabashed, we got back on what was left of the GR-7 route for this walk and trekked further up the hill. At the half way point, we sat and enjoyed pastries left over from our breakfast, saw our first Almond blossom and took in the panoramic view: to the left, the snow covered flat top of the Sierra de Gádor, the formidable (and reputedly haunted) mountain that folds down to the wide plateau below - a waffle-like landscape of gorges and flat-topped hills. Looking southwards, a wall of lower peaks provide a final barrier between the Alpujarras and the Mediterranean Sea, and looking to our right, the valley starts to close in one itself as it approaches Órgiva to the west. We could see for miles; there was no sound apart from the odd song from a bird, the sun was warm and the air clear. For a while it has been dawning on me that I am not sure I could leave all this behind to return to the UK, a thought I shared with Andrew and a thought that he, himself, has been harbouring. So, the incentive to make our lives work here is even greater. Our walk took two hours, ending up back in the village for a quick coffee before we got back in the car to cross the mountains. Puerto de la Ragua had been suggested to us by Juan, one of our intercambio chums. He had suggested the place as an alternative to the Sierra Nevada Ski station, if we ever fancied an inexpensive ski. It is a ‘resort’, but on a very small scale, used by toboganners and cross-country skies; there are no ski lifts. 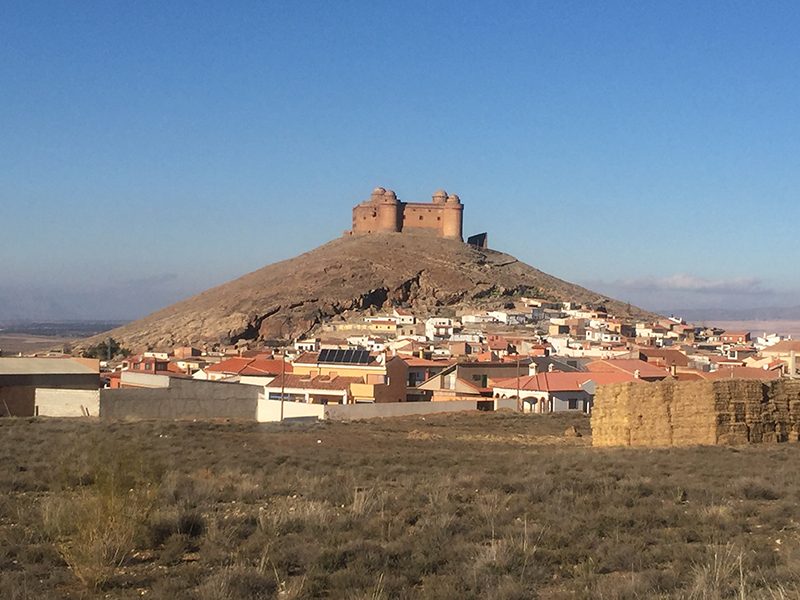 Our route took us through Ugíjar (try saying that when you know that the Spanish use a soft ‘g’ and pronounce ‘j’ has an ‘h’ - the town sounds like Ooh-Hee-Har). I think Andrew may have got fed up with the sound after I had uttered it around 100 times. Ugíjar looked to be a rather charming and well-heeled town, and we certainly thought we’d like to pay a return visit. The road from Ugíjar (see, I can’t help myself!) winds up past Laroles and up into the mountains. It is a very picturesque road, and as we rose ever higher we started to see a broad band of golden, shimmering light behind us as we began to see the Mediterranean over the mountains to the south. To our right, deep snow covered an adjacent peak and we hit the snow line, transported immediately into another world of pine trees and and Narnia-like landscapes. We imagined how beautiful it must be up here after a fresh fall of snow. 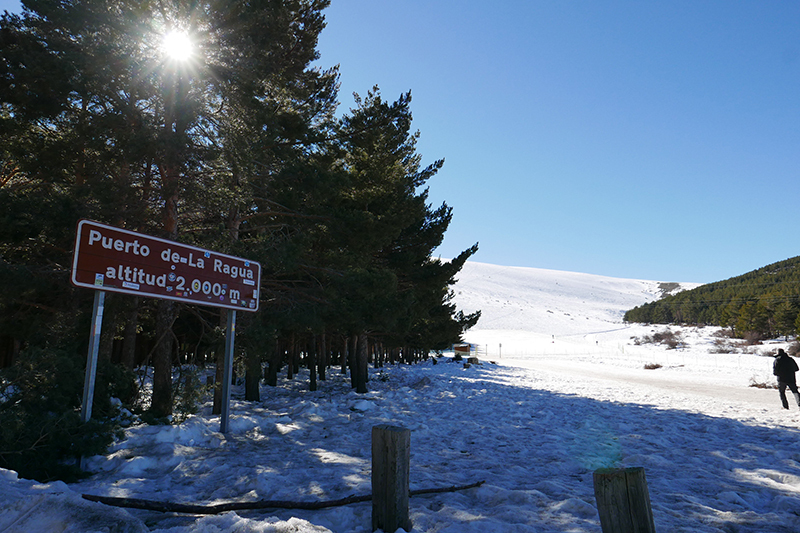 Puerto de la Ragua stands at an altitude of 2,000 metres and is very low key. There is a car park, a building that purports to be a restaurant, but was closed, and an equipment hire shop. Here, you can get toboggans and cross-country skies, and the prices for hire and ski pass is a fraction of the prices at the Sierra Nevada Ski resort. Neither of us has ever tackled cross-country skiing, but I think we might start. Clearly marked pistes weave through pine forests, and they look magical. As the restaurant was closed, and we were peckish, we pressed on down the other side of the mountain on the look-out for a welcoming Venta. The road was devoid of any such establishments, but the views of the length of the Sierra Nevada were more than impressive; being the north-facing side of the range, I suppose it was no surprise to see so much lying snow. As we neared the bottom of the mountains, and with the Indian Raj-like castle (It is actually Italian Renaissance, but looks like something from Jaipur) of La Calahorra in the near distance, there was a sign bearing the legend ‘El Hogar de Ferreira’ with a picture of some meat being sizzled on a grill. Quick detour and a delicious lunch, although one of the tapas happened to be mushrooms (Andrew’s nemesis). We had hoped to drive home along the northern edges of the Sierra Nevada via Guadix in order to see the cave houses. Unfortunately, the countryside between Ferreira and Guadix is pretty uninspiring, bordering on the downright creepy, and by the time we reached Guadix I have to admit that I was ready to get home to have a cup of tea in front of the fire. I think Guadix may be worth another look, and the cave houses will certainly be on our list; I read that the friendly inhabitants are often only too happy to invite visitors in to their homes to have a look! So, a circuit of a large part of the Sierra Nevada mountain range navigated. We haven’t done the eastern most area, but will tie this in with a future visit to Almeria, the rugged coastline of Cabo de Gata and the desert regions…..so much diversity.